Cinema has not been kind to taxidermists. Norman Bates is the classic example amongst a small sampling. Ernée Bisquit is nothing like him, except for his extreme shyness and awkwardness around women. 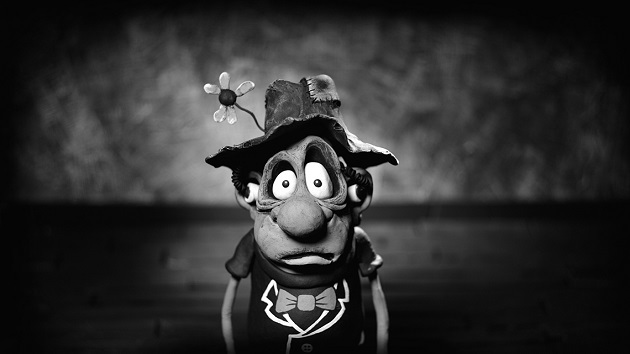 Spurred by an unlikely catalyst, the sad sack Bisquit takes drastic steps to rejuvenate his drab existence in Adam Elliot’s Claymation short, Ernie Biscuit, which screens during the 2015 Montreal World Film Festival. Bisquit was always a bit of an outsider, but it was a cruel childhood prank that rendered him deaf. He inherited his family’s Parisian taxidermy shop, but he never had much passion for it. The last time he felt a deep personal connection was with a young Jewish girl, whose family lived in the flat next to Bisquits’ in early 1940s. Tragically, they were never seen again after the infamous round-up, but Bisquit still cares for her pet duck. Realizing taxidermy is out of fashion in 1966, Bisquit impulsively sells his shop intending to relocate to Venice, where he and his first and only love dreamed of visiting. However, Bisquit and his duck get on the wrong plane, ending up in Australia instead. Complications and misadventures necessarily ensue, including the Australianization of his name. Yet, Bisquit also manages to meet a flesh-and-blood woman. She has plenty of issues too, but that might just make it perfect, provided he survives the rest of the chaos engulfing him. If Biscuit qualifies for Academy Award consideration, it should be the odds on favorite. Elliot already has one Oscar for his short Harvey Krumpet as well as considerable name recognition amongst the animation community for his feature film Mary and Max. His style is instantly recognizable, particularly his sensitively grotesque characters. Clearly, Elliot has a keen empathy for underdogs like Bisquit, but there is still a sense of playfulness throughout Biscuit. Somehow, the film manages to be consistently funny and genuinely touching, without ever getting shticky or saccharine, which is a neat trick really. The distinctive music heard over the closing credits is Simon Park’s orchestration of the Van Der Valk theme, “Eye Level.” Evidently, music written for Dutch canals works just as well for those preoccupied with Venice. Regardless, it is another eccentric element that turns out perfectly. Occasionally somewhat macabre, but ultimately quite beautiful, Ernie Biscuit is very highly recommended when it screens this Tuesday (9/1) and the following Monday (9/7), as part of this year’s Montreal World Film Festival.